One of the greatest joys of owning a cat is playing with them. And this activity becomes a lot more fun if you have a range of toys which they love. Cat toys come in all shapes and sizes, but the best ones are highly stimulating, engaging, and will continue to provide them with pleasure for years to come. In this blog post, we have compiled a list of some of the best cat toys available to help you choose some for your feline friend. So, enjoy this purr-fect guide! 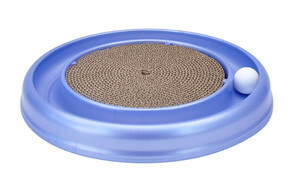 A highly popular interactive cat toy, the design is simple, yet ingenious. Around the outside is a channel and a ball which your cat can nudge around. In the middle is a textured scratchpad, which is durable, and also replaceable when it wears out. One of the main advantages is that it will help to keep your cat from ripping up your furniture! Catnip is also included to encourage your furry friend to play with the toy. Bear in mind that this is a toy which is meant to be enjoyed under supervision to protect your cat’s safety. Recommended by vets as an interactive toy for exercise, and your cat will love jumping up to catch the handwoven mouse which dangles from the flexible wire. The reviews are highly positive, which is testament to just what a popular toy this is amongst felines and their owners! As for the braided safety wire, it is created in a way to make your cat lose sight of it, so they can fully concentrate on trying to catch the mouse. At the top of the wand is a soft tip which helps to prevent injuries. You can also clip or remove other Go Cat toys. As a cat owner, you will already be well-aware how much they love catnip. These three mice catnip toys contain this enticing substance, which is produced without any chemicals and pesticides They are also the ideal size to bat around and chase. 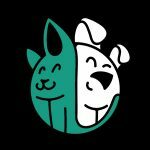 As for the filling, it is made from 100% recycled plastic, so you can rest assured that these cat chew toys are made in an environmentally friendly manner. Designed to stimulate your cat’s senses and encourage their natural hunting instinct, three brightly colored balls spin around the three towers of this toy. You can be confident that it is durably built with a closed top, and it is also ideal for one or more felines. Of course, your cat is likely to get quite excited as they are playing with this toy, but the non-slip base ensures that it stays firmly in place. Ultimately, this is a great toy to provide your cat with the mental and physical stimulation which they need for a happy and healthy life. This pack of 12 catnip-filled mice ensures that your feline companion will never be short of a toy to bat around and chase. Each one is colorful and the ideal size for your cat to hunt, which is one of their natural instincts. Since they are lightweight and compact in their design, you can toss them around for your cat to catch or let them run around while you supervise all the action. A fun and simple way to play with your cat, this multicolor teaser wand gives them something to chase around and catch, which is something that felines of all ages love to do. It is made in the USA using high-quality materials, so you can rest assured that it is safe. The polycarbonate wand is lightweight and easy-to-wield, while the ribbon is four feet long, providing plenty for your cat to chase. If your feline doesn’t go outside, this is an ideal cat toy for indoor cats. Not sure what to buy your cat? Why not go for this set of 20 assorted toys which provides them with plenty of choice of what to play with? Just some of the items included in this pack are balls, mice, and feathers in various designs. Give your cat the chance to choose their favorite! Of course, you should always replace toys which become damaged, but you have so many different choices here that you have a backup ready to go. A clever play circuit which is bound to keep your cat intrigued, the peek-a-boo design allows your cat to see the balls as they move through the tunnel. The color combination has been specifically designed to capture your cat’s attention and hold their interest for an extended period of time. Since there are various layout options, your cat will never get bored. You can also buy extra tracks separately to increase the size of the set-up. One of the main advantages of this interactive cat toy is its extra-long and flexible handle. Five different feathers are included – each with its own little bell to encourage play. So, you won’t have to keep buying replacements when one wears out. Giving your cat something like this to play with is one of the best ways of encouraging them to exercise. Not only are the materials cat-friendly, but they are also non-toxic. Another triple-layered ball to which are so popular amongst cats, your feline will love trying to try them free. It is designed to mimic the kind of mental and physical stimulation your cat would get from a regular hunting session. Since there are no pieces which are designed to detach from the toy, there is also less of a risk that anything is going to present a choking hazard. Not only is the toy sturdy, but it is also lightweight too, so you can comfortably move it around from place to place. Both a toy and a food dispenser, this interactive device fulfills two purposes in one. Since your cat has to chase and bat the ball around to get their food, it encourages exercise and also works to slow down a feline who tends to wolf down all their food too quickly. The openings are adjustable, so you can control how your cat accesses their food. When you need to clean the device, it is suitable for the top shelf of the dishwasher. This is the kind of cat toy which is created to stimulate and keep your cat busy for hours. There are three difficulty levels depending on how skillful your feline gets at playing. It is ultra-lightweight and offers excellent mental stimulation. You can use it in combination with your cat’s favorite treats, and it also works well as a food dispenser. So, if you have a cat who is an overly eager eater, this helps them to slow down and encourages them to take their time. Give your cat a bit of extra encouragement to chase their ball around and have some fun with this self-rotating ball. It produces a red light to grab their attention and will also change direction whenever it collides with anything. Three sets of batteries are also included in the package to ensure that your pet can continue enjoying their toy for a long time to come. This toy brings a new dimension to your cat’s playtime sessions and is a great addition to your toybox. A simple toy which is available in a range of different designs, it is filled with catnip to encourage your cat to play with it. The strong aromas produced are highly likely to draw your cat in to bat it around. If you have never bought catnip toys before, it tends to produce a playful reaction in most felines. This kind of toy is suitable for cats of all ages, putting it amongst the best kitten toys. As well as promoting physical activity and mental stimulation, it helps to fulfil the natural hunting instinct of your feline friend. This clever little toy is designed to mimic the movements of hidden prey with a wand which peeks out and moves underneath the fabric. Depending on how skilful your cat is getting at catching it, you can adjust the speed to keep them engaged. Two replacement wands are also included in the kit, and you can rest assured that the wands and base are all made from recycled plastic. Also, everything has been tested to child safety standards. If you have the kind of cat who loves hiding and getting themselves into tight spots, this is the ideal toy for them. The built-in crinkle paper and dangling ball encourage them to get inside, while there is also a peephole which they can stick their head out of in the middle. As for the material, the tunnel is made from tear-resistant polyester wrapped around a stainless-steel frame, which help to ensure its durability. It is both easily collapsible and portable so you can pack it away or transport it around as needed. While this toy may seem extremely simple at first, sometimes, these are the things that cats have the most fun with. Just check the customer reviews for confirmation of this fact! Essentially, it consists of rolled paper tubes which have been attached to a wire which you can hold at one end. Cats love to swat and bat dangling objects, and your feline will go nuts when playing with it. Make your cat work to get their food with this egg-shaped food dispenser. They have to knock it over in just the right way to access the treats which you have hidden within. The openings are adjustable depending on the size of kibble you put in and how hard you want them to work. Whether you are trying to encourage your cat to lose weight, you think that they need to slow down their eating, or you would simply like them to have some fun at mealtimes, this is a great kitty toy for them. 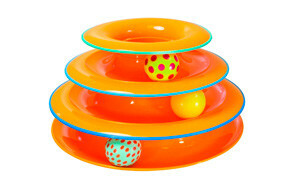 These cool cat toys are springs which are designed to keep your cat engaged with their random bouncing movements. Since they are extra-wide in their design, this helps them to bounce stronger. The colors are bright enough to grab your cat’s attention. All felines have a natural love of batting things around, and these toys provide a great way of fulfilling this desire. Just like kids love a play mat, it turns out that cats do too! As well as providing them with a comfortable place to lie on the soft plush material, there are also four interactive hanging toys which they can bat around at will. The main frame of the interactive playmat is made up of safe plastic with rounded edges to ensure that your cat is not going to hurt themselves while they are playing. You may believe that you have already selected the perfect toy for your cat, but it is worth thinking in a little more detail about some of the key features to ensure that you are making the right choice. So, here are a few things to look out for. First and foremost, your cat’s safety should take number one priority. Check for small or sharp parts which could break off and are at risk of being swallowed. Inspect the toy to ensure that it seems durable enough to withstand many play sessions. After all, you don’t want your cat to break the toy when they have only just got it home. Bear in mind that no matter how well the toy seems to be made, the best way of ensuring that your cat stays safe while they are playing is by supervising them at all times. This way, you will be able to react to any risk quickly. While a cat toy may seem like a great deal at first, this is not going to be the case if it breaks within a couple of playing sessions. So, check what sort of materials the toy is made from, as well as the trustworthiness of the brand. You should also inspect the customer reviews to see what other people have to say about it. Often, you will get information which the manufacturer didn’t tell you. Of course, you should take a wide sample of reviews and not just listen to one or two highly good or bad ones. Some of the above toys come with replacement parts to ensure that you can keep on using them for a long time to come. The movement of the cat or kitten toys have a big impact on how much they engage your feline’s attention. Even though your cat is entirely domesticated, their play technique is still based around their natural hunting instincts. There are a number of different ways in which the cat toy can mimic prey including movement, shape, and design. Perhaps it is a mouse which your cat bats around the floor on their own or a wand which requires you to be part of playtime. Some toys are even designed to move around on their own. If you know a bit more about how your cat likes to play, it is easier to buy them the type of toy which they love. The size of your cat and the size of the toy which you buy for them should match up. If the toy is too big for your pet, they could find it too intimidating to play with in the way that they would like. If it is too small, they may not find it engaging. Remember that cats are natural hunters who take on prey because of its size, as well as how appealing it seems to them. If you have a young cat who is still developing, you could look at kitten teething toys. Another feature which could play a role in your decision-making process is the texture of the cat toy. A lot of this comes down to your individual feline and how well you know them. Some cats prefer softer toys which are easier to sink their teeth into while others prefer smooth ones which are more slippery and easier to knock around. Some cats love crinkly toys which make a noise every time they are stepped on, while others prefer something harder. Ultimately, the choice is yours and your cat’s! One of the most attractive scents which encourage cats to play is catnip. Bear in mind that not every single cat will respond to catnip, but the ones that do will find it intriguing and it is likely to stimulate their desire to play. While you may not want every single one of the toys which you choose to contain catnip, having one or two can really help to step up playtime. Rather than having them available all the time, you could bring them out for an extra dosage of excitement! Another influencing factor is the type of sounds which the toy emits. Bear in mind that your cat has sensitive ears and can be jumpy. For example, some larger and motorized toys can end up startling your cat and having the opposite effect to the one that you were intending. Some toys contain little squeakers which are designed to stimulate their playtime activities. Again, everything comes down to your individual cat, what they enjoy, and what they don’t. You may need to clean your cat’s toys from time to time – particularly if they are the food dispensing variety. So, you should investigate how you can clean the toy. Some are as easy as putting them on the top shelf of the dishwasher, while others will require you to do the cleaning by hand. As for the mice and other soft toys, you should check whether you can put them in the washing machine or not. While you want the toys to be as clean as possible, you don’t want to risk causing any avoidable damage. As well as mental and physical stimulation, you may also want to look at what other benefits the cat toy will offer to your feline. For example, some of them include scratch mats or other textured surfaces which help to fulfil their natural desire to sharpen up their claws. This helps to keep them away from your furniture! Another common type of cat toy is the food dispensing variety. If you have a cat who tends to overeat, this helps to control their eating and makes them work for their food. Ultimately, you should look at a toy as a full package when it comes to working out what it can do for your four-legged friend. Playing with your cats is not just a fun distraction; it is also important for their mental and physical health. Here are just a few of the top reasons why it is crucial for your feline friend to play. As we have already mentioned, cats are natural hunters who have an inbuilt desire to hunt their prey. If you have an outdoor cat, this can manifest itself in unwanted ‘presents’ like birds and mice brought in by your furry hunter. Playing with your cat for a few minutes every day can help to satisfy their inbuilt desire. Of course, the toy needs to be stimulating enough to hold their attention. If you are the one controlling it, you should let your cat catch it from time to time to allow them to feel like a predator. As many as half of cats are overweight, and they are especially at risk of becoming plump if they are indoor felines. Therefore, it is so important that you help to provide your pet with the physical activity which they so badly need. If your cat becomes obese, this is likely to increase the risk of them suffering from a whole host of negative health conditions such as arthritis, diabetes, and heart conditions. Try to vary the toys which your cat plays with, as well as the games you play with them to hold their interest and ensure they get daily exercise. Just like you, your cat can also suffer from feelings of boredom. And when they don’t have enough to do, they are more likely to engage in bad behaviour like scratching up your furniture or making their own playtime with your treasured possessions. if you have an indoor cat, they are going to end up being cooped up indoors for hours at a time. Play helps to offer your cat the mental stimulation of exercising their cognitive and motor skills. A stimulated cat tends to be a happier cat, so take this as another incentive to engage your cat in playtime whenever you get half a chance. What pet owner doesn’t want their furry friend to love them just a little bit more? Playing with your cat encourages this forging of a closer bond between the two of you. If you have a kitten, playtime is an especially important form of stimulation which helps in their development. Rather than always just sticking to the same types of toys and games, you should try to vary what you buy for them and try out different activities. Your cat will naturally start to associate you as a source of fun and adventure. Not only is playtime fun for your cat, but it should also be exciting for you as well. There is so much entertainment to be enjoyed while watching your cat bounding around the house or leaping up to try to reach that dangling feather. If you are sick of the same old games, now is the time to find some new ones which are going to provide you with hours more fun. Have you found that your cat doesn’t enjoy playing with a particular type of toy? Don’t worry; there are plenty of different varieties out there to choose from, so you are bound to find something they love. The simplest toys are often the best ones, and this is certainly the case with balls. While some of these are free-rolling for your cat to chase around on their own, others are lodged in tracks which your cat will enjoy trying to dig out. Some of them are spiked with catnip to encourage your feline to play with them, while others are interactive and will bounce off surfaces and move around of their own accord. Essentially, you can experiment with your cat to find out which ones hold their interest the most or choose a variety of different ones. 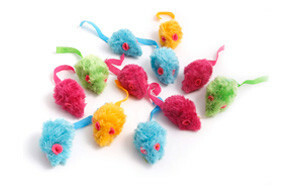 Stuffed toys often come in mouse-form or another type of small creature which your cat would naturally enjoy hunting. Generally, these are lightweight and easy for your cat to bat and toss around as they would like. Sometimes, they are filled with catnip for a bit of extra encouragement. Usually, they come in bright colors which are easily visible for your feline. These are an affordable type of toy which are well worth adding to your cat’s collection. As we mentioned earlier on, many of the best cat toys are the ones which stimulate your feline’s natural desire to chase and hunt their prey. Often, these come in the form of a wand with a feather or another object dangling off the end of it. The best ones have a sturdy handle and string which will withstand your cat’s attentions, as well as keeping your hands well out of the way of slashing claws and biting teeth! Some of the above options also come with replacement feathers or other dangling objects when the originals are no longer usable. Cardboard scratchers and motion toys are just two which fit into the category of interactive toys. Essentially, these are designed to give your cat something to engage with. Some come with treats inside which your cat must work to access. Others include feathers hidden under a mat which your cat has to catch. Often, they feature a way which you can increase the difficulty level so your cat can face a greater challenge. You have probably already noticed that a lot of cats will chase and attach anything which moves – as long as it is small enough to seem like prey and not a threat. Some cats have preferences of what they like to go after. Knowing your cat’s personality a little bit better will help you to select toys which are best-suited to them. The only way that you are going to be able to tell what your cat enjoys is by experimenting with different toys and activities. Whichever variety you choose, you should try to make the toy move like the prey would. Movements should sometimes be fast and slow, while other times the toy can alternate between being hidden and seen. When your cat hunts, it is as much about the mental stimulation as the physical exercise. You can also get them some toys which encourage solo playtime. After all, cats traditionally hunted on their own. Some cats prefer to chase toys which stay close to the ground. If your cat likes crawling and stalking their prey stealthily, this could be the type for them. Alternatively, you may have an older or physically limited feline who cannot jump up to attack objects in the air, but still loves to go after things which stay grounded. Otherwise, you may have an especially timid or anxious cat who doesn’t like to make themselves vulnerable by jumping up in the air. Perhaps you have a cat who simply loses interest when the toy moves off the ground level. Balls and mice toys are a couple of good examples of those which are designed for on-the-floor usage. The opposite type of cat hunter loves leaping up into the air and catching the toys which dangle over their heads. The cat teaser toys are a good way to stimulate this type of feline, and they can also be used at ground level as well. Even cats who love leaping around appreciate movement on the ground as this makes it easier for them to catch the toy. Avoid keeping the toy continually out of their reach as this can lead to them getting frustrated and losing interest. Otherwise, they may end up jumping too high and causing themselves an injury. A: You may find it strange that your cat wants to drop their toy in their water bowl. This is especially common behavior that indoor cats exhibit. While the reasons for this are not immediately apparent, one possible explanation is that they are looking for a safe place to keep them, and they view their food area in this way. Cats in the wild would take food back to their nest area to indicate it is their property and to hide it from potential predators. Alternatively, this could be an indication of a gathering or collecting instinct. A: Again, this can be explained in a similar way to the above question. Cats have a very strong sense of ownership, and their bed is likely to be an area where they feel safe and secure. They may develop a sense of ownership over one or more of their toys, or it may also be a substitute for their prey. Either way, they want to put it in a place which they consider to be theirs. A: Cats behave in a very territorial manner, and your home is their patch. They also have a natural hiding instinct. Just think of the way that they cover up their business in a litter box. Some even try to cover up their food when there is nothing there to act as a lid! This sense to stealth and secrecy may go some way toward explaining why your cat hides their toy everywhere and anywhere when they get half a chance! Our best cat toy on the list is this one from Bergan. Running around the outside channel is a ball, while the center is a textured scratch pad which allows your feline friend to sharpen up their claws. Not only does this help to keep them interested and engaged, but it also protects your furniture from getting scratched to pieces. This highly-rated product is the kind of toy which can provide your cat with hours of entertainment. For us, it is the kind of toy which should be in every owner’s collection.